Q: I met a man who seemed to be just right…a little older, financially stable, professional, interested in me. It felt like this could be “it”, but he is a strong, wants his own way kind of personality. He pushed me to go on a vacation together, his treat. Turns out he is a horrible gambler. The whole trip was a shocking disaster. I keep attracting men like this, and after this experience I wonder if I will ever have a good relationship. I had a career reading with you last year, and liked the way you look at things. Can you give any insight to the romance side of things? A: I think you are right – this experience was shocking. The good part about shocking is that it got your attention. It helped you see a pattern, and to realize you want something different next time around. As traumatizing as it was in the short term…in the big picture this may actually turn out to be a valuable experience. There are two tarot cards that dial right in to your situation: The Lovers and The Magician. They are both major arcana cards…which speaks to the power and importance of the things your are thinking about. 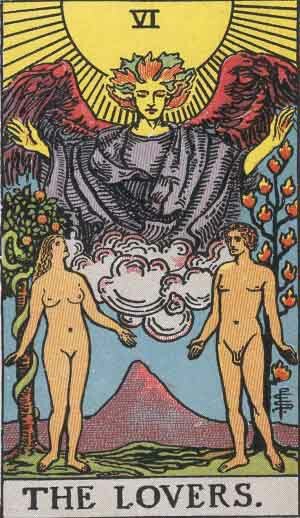 The Lovers symbolizes desire, and The Magician represents transformation and manifestation. The way you described this man really caught my attention and says something important about the lesson at hand: it shows that you are more interested in your partner’s character, spirit and personality than superficial appearance. The deep down important stuff is what matters to you. If anything this “bad” experience highlights even more the kind of things you are really looking for in a relationship. This will give you a wonderful contrast…the shadow to show you what you want to bring to light. You might have just learned the hard way that a healthy personality is more important to you than healthy finances. Strength of character can come at any age – older doesn’t necessarily mean wiser. Now, after this experience, you know more clearly what you DON’T want. The next step is to define in your mind, very clearly, what you DO want in a relationship What you do want in your relationships and in your life? The feeling I got reading the first part of your story is that your connection with this man grew out of expectations…your hope for a relationship plus what other people define as a good prospect…stable, professional etc etc. That doesn’t, as we see here, necessarily bring the intangible, subtle good things, like respect, caring, compassion, empathy….all those things that are REALLY important. I was given a wonderful exercise to help with this by a very wise intuitive, Sallie Christensen. I’ve used it and it works. Other people have told me it works, too. Even if I’ve mentioned it and you’ve done this before…try again, start over, this time use the new things you’ve learned from this trip. Take care not to put it all in negatives (not pushy, not a gambler, etc) Always use present tense positive language: He is considerate. He is careful with money…what have you. The exercise is easy. Decide what kind of relationship you want and describe it. Do you just want to date? A companion? Friend with benefits? Husband? Soulmate? Then describe the perfect person. List anything and everything that honestly comes to mind; physical appearance, interests, personality traits – anything, everything. Once again, don’t use negatives. That part is very important…the energy of the “not” might actually draw the undesirable trait to you rather than block it. Always list ONLY the things you WANT in a positive way. When you are done, release the list. Put it away and don’t look at it again for at least a year or two (or until Mr. Wonderful shows up, whichever comes first) If you are inclined to such things, (safely) burn it in a ritual of some sort, to symbolize releasing your wish to the universe to be fulfilled in the highest and best way possible. If it feels like a magic spell, it is and it isn’t. There is no direct control of other people or circumstances. Think of it like “wish craft” rather then “witchcraft”. This is the energy of the Magician card. It isn’t controlling other people. It is finding your way to like energy. It is drawing like energy to you. Like attracts like. Love attracts love. Trust attracts trust. That is the kind of attraction and manifestation the Magician card teaches. Lovers is your desire for a good relationship. 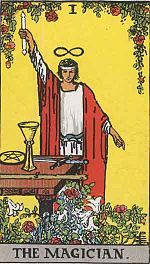 This spiritual aspect of the Magician card is how you can find your way to that desire. Whenever you feel the impulse, send a thought to the universe. Pray it…however it feels most powerful to you….not the whole list, just the feeling of desire for “the best of the list” or “husband for the highest and best”…something like that. Send the cry from your heart to the heart of outer space…then let go and trust the universe to guide you to the right path. There are no time limits. Love isn’t bound to our schedules or our expectations. There may be more things to learn along the way…but if you ask to find the path to love, the highest and compassionate best, the journey will be a good one, no matter how long it takes to get to the destination.